/ Guest post / Where do the numbers in venture deals come from? A look at the basics of a venture deal. The startup sells 250 new shares (20%) to an investor. In 5-7 years the investor sells these shares either to another investor or an industry buyer. The buyer pays the investor $2M. The investor pays the startup $200K. Where do the numbers in this venture deal come from? Why sell 250 new shares to the investor? You assume that in 5-7 years your startup will have an exit value of $10M. You assume that the investor wants a money multiple (MM) of 10.0 or a 10x return. That means he wants to make $10 on each $1 he invests. 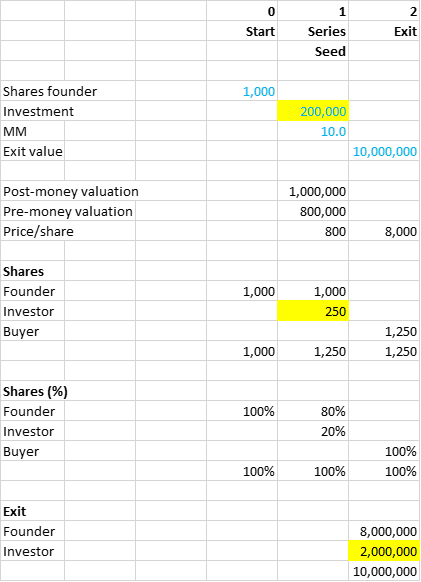 So the post-money valuation = exit value / MM = $10M / 10.0 = $1M. You assume an investment of $200K. So the pre-money valuation = post-money valuation – investment = $1M – $200K = $800K. You have 1K ordinary shares outstanding before this deal. So the price per share for the Series Seed = pre-money valuation / # shares outstanding before deal = $800K / 1K = $800. The number of shares you sell to the investor = investment / price per share = $200K / $800 = 250. In 5-7 year the investor sells these same 250 shares to someone else. Why does this buyer pay the investor $2M? You have 1.25K shares outstanding before this deal. So the price per share for the exit = exit value / # shares outstanding before deal = $10M / 1.25K = $8K. The buyer pays the investor = # shares * price per share = 250 * $8K = $2M. Why does the investor pay you $200K? Your cash-flow planning shows you need a $200K investment. So that is the price that you ask for your shares. Cross check: the investor pays you = # shares * price per share = 250 * $800 = $200K. Now you also understand why negotiating with an investor will be negotiating about the exit value and his MM. 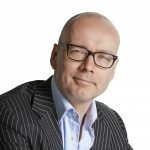 Joachim Blazer is an advisor. He helps founders get the best venture deals. Contact him at hello@joachimblazer.com. This article originally appeared on his website.